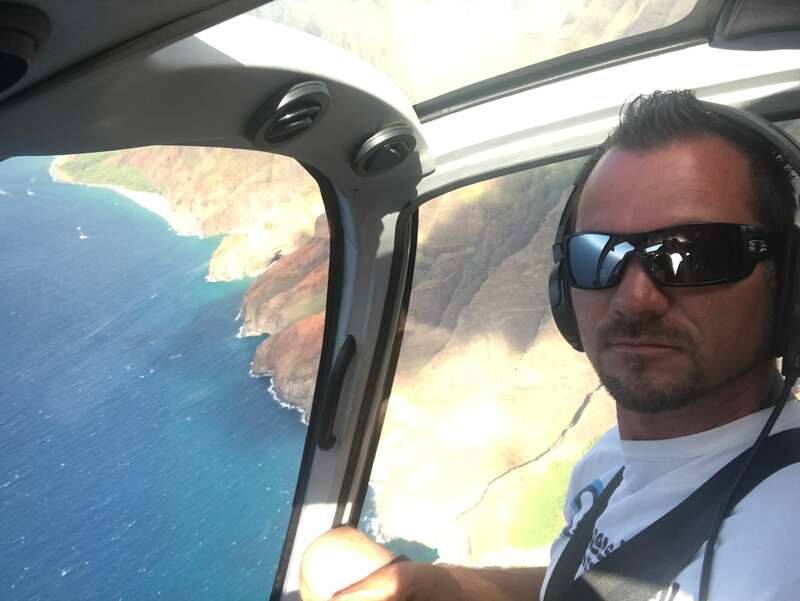 A helicopter ride over Kauai is an absolutely breathtaking experience and the best thing you may ever have explored! Our private tours on Kauai are very individual. 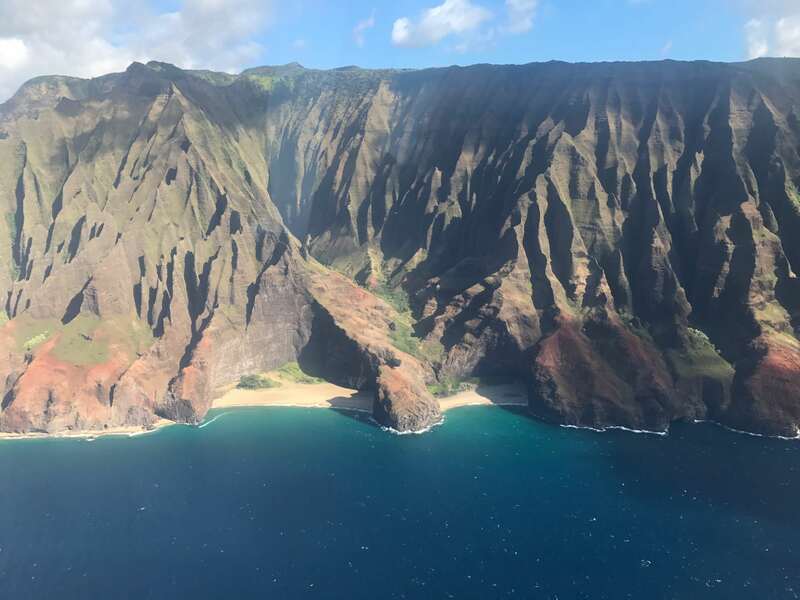 Basically, we can organize everything from a helicopter ride, a sailing yacht cruise to explore the beautiful Na Pali coast or swim with dolphins. Let us know, what you want and we will organize it. The island of Kauai, with its sublime waterfalls, multi-hued Waimea Canyon, lush rain forests, and fluted, deep-green coastal cliffs is definitely a tropical paradise. However, only two-thirds of the island and 90 percent of its waterfalls can only be seen by taking a helicopter or a small airplane. Most parts of Kauai are not accessible by walking or driving due to steep slopes and the density of the jungle. Flying in a helicopter, you can see places that have never been touched by humans. This ride is an incredible experience, you will never forget! Blue Hawaiian Helicopters, located next to Lihue International airport, will give you a short safety training before you start your flight. After a short introduction, you will be escorted to a helicopter which holds about six people. You will have excellent views from every seat due to large windows. The helicopter will take you over green valleys, mountains, waterfalls, canyons and beautiful beaches. By the way, the first movie of Jurassic Park was filmed on Kauai. If you have a good imagination, you might even see some dinosaurs there well. If you want to book a helicopter ride on Kauai, click here. The ride takes you over beautiful valleys and mountains. Whenever you think, the view can not get any better, the pilot flies into the next valley and shows you amazing waterfalls. If you are lucky, you can also see one of the most spectacular rainbows! The pilot will also fly you into the interior of a dormant volcano formed more than 1.5 million years ago. Kawaikini Peak is Kauai’s highest point at 5,148 feet and has been known as the wettest spot on Earth, with over 400 inches of rain per year. The most spectacular geographical landmarks on Kauai are the Napali Coast and the Waimea Canyon State Park which is also called the “Grand Canyon of the Pacific”. Places, you can only explore by air. You want to see helicopter ride videos on Kauai? Then click on our playlist on Youtube. We are glad to show you the beautiful island of Kauai by land and by air. Contact us to book a private tour on Kauai. More info on Facebook.